Radio Rant: Imagine Dragons – Radioactive | Ranting About Music! Hello, and welcome to Radio Rants. Today, we’re looking at a relatively obscure song you may not hav–nah, I’m kidding. It’s “Radioactive”. Even though it’s been years since rock was a top 40 mainstay, every year, the charts eek out room for two or three big songs by actual bands. We’ve gotten “Everybody Talks” and “Pumped Up Kicks” out of it, but also the bad version of “Tonight, Tonight” and Gym Class Heroes, so be careful of what you wish for. Before we get started, I have to get this out of my system: I’ve never been too big on Imagine Dragons. I know a lot of people liked “It’s Time”, but I was never one of them. Lead singer Dan Reynolds always came off as grating, and that mandolin lead always reminded me of a sped up version of the chorus to “Love Story” more than anything else. Going further than that, Imagine Dragons have no personality behind their music. Mumford and Sons might not have any characterization beyond “Earnest Folkies”, but at least it’s something. All Imagine Dragons brings to mind is “rock band”. They fall into the same space that Hot Chelle Rae did: this doesn’t look and sound like a band so much as it looks and sounds like someone’s idea of a band. Like, it’s not hard to imagine a fictional group of plucky teenagers getting permission to go see Imagine Dragons live, complete with a laugh track when the parents get the band’s name wrong. So, with that, let’s look at the group’s longest charting single and possible rock band-iest song title ever, “Radioactive”. Credit where it’s due, Imagine Dragons have neatly set themselves up to be this decade’s Linkin Park. Like early 00s LP, Imagine Dragons found the happy medium of having enough rock-sound credibility to come off as genuine while being tame enough for mass appeal. In LP’s case, it meant making nu-metal look a little less Limp Bizkit and more Lance Bass; Imagine Dragons incorporate everyone’s favorite musical punchline into their sound: dubstep. “Radioactive” has other parts to it–I’ll get to those in a minute–but we all know that the massive, dubsteppy chorus is what’s kept the song alive for this long. “Radioactive” isn’t the first song to co-opt dubstep for a hook: Muse’s rock radio hit M-M-M-“Madness” wubbed along in a surprisingly restrained mood for them, while Alex Clare’s “Too Close” had a dubstep hook that Skrillex would have passed on for being a bit obvious. But, I’d argue, “Radioactive” does it best for blending the electronic sound into their band set up, even if it includes a cartoonishly oversized drum. There’s an organic sound behind the drums, and Reynold’s vocals sound as big as they need to, but still stay out of the way. Add that to the song’s “We Will Rock You” beat, and you have an inelegant but effective chorus. Ok, now to talk about parts of “Radioactive” that aren’t the chorus…uh…hm. Oh! The song starts with some rather nice acoustic guitar strumming that’s never heard from again, and as late as a month ago, I didn’t know was part of this song. But, considering the wubby stomp of the rest of the song, I don’t feel bad for forgetting. 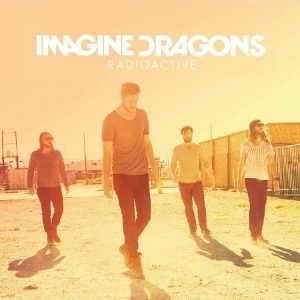 “Radioactive” is a bit of a knuckledragger; the stomping beat, simple melody, and straight forward apocalyptic lyrics don’t leave any room for interpretation or much in the way of depth. It’s just a rock song. “I’m waking up to ash and dust/I wipe my brow and sweat my dust” That’s actually kind of clever. “I’m breathing in the chemicals/[GASP AND EXHALE]” And using an inhaler in the recording booth, apparently. “I’m breaking in, I’m shaping up/then checking out on the prison bus” …prison bus? At what point was there a prison in your apocalypse? “I’m waking up, I feel it in my bones/Enough to make my systems blow/Welcome to the new age” It’s going to get stuck in your head, but none of this means anything beside “COOL IMAGES”. “This is it, the apocalypse” Yeah, we know. If this song was any more on the nose, I’d have a nosebleed. Aside from the overplay, “Radioactive” is in the unpleasant category of being good enough to enjoy without being good enough to like. It’s something a little different than what anyone’s done before it, but doesn’t scream longevity or vital. It’s an ok listen, but nothing I’m ever going to revisit once it (finally) sinks off the charts. If this is the future of radio rock, then welcome to the apocalypse. This entry was posted in Radio Rants and tagged Imagine Dragons, Night Visions, pop rock, radio, Radioactive, review, rock, song. Bookmark the permalink.